The 25-year-old US-American clinches his fourth ITF singles title. More than 200 kids from local community programs from all over the greater Los Angeles area attended the Calabasas Competitive Pathway – Net Generation Kids’ Day at the USTA Men’s Pro Tennis Championships of Calabasas last Saturday. Kids from the Pete Brown Foundation, Neighborhood Junior Tennis Program in Sylmar, TGA Premier Tennis of San Fernando Valley, Top Seed Tennis Academy amongst others were introduced to the sport of tennis and participated in fun skill-based tennis games in a carnival atmosphere. The event is part of the USTA’s Net Generation, the official youth tennis of the USTA, aimed at inspiring the next generation of tennis players by promoting youth tennis and encouraging children to develop a healthy lifestyle through fun activities. 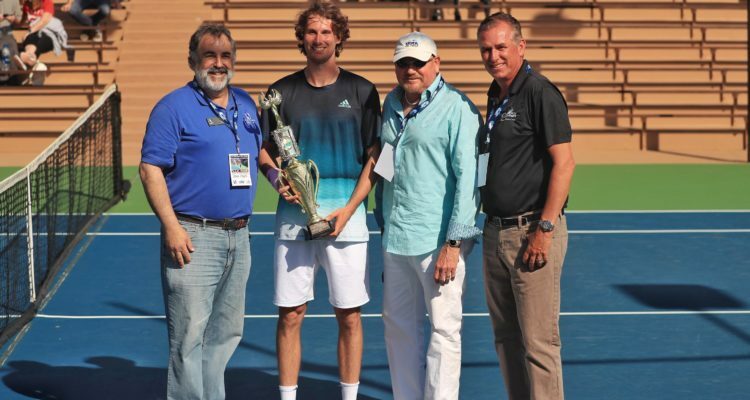 On Sunday, Alexander Ritschard clinched his fourth ITF title, winning the singles final of the ITF World Tennis Tour M25 hard-court event held at the Calabasas Tennis & Swim Center. The unseeded US-American defeated compatriot and the tournament’s No. 2 Stefan Kozlov 6-2, 0-6, 7-6(5). Ritschard, who was born in Zürich, Switzerland and started representing the United States in April last year, broke his opponent’s serve four times to secure victory in two hours and 32 minutes. Later in the day, Boris Arias of Bolivia and US-American Sekou Bangoura took the doubles crown. The No. 3 seeds cruised past the all-British combination of Jack Findel-Hawkings and Ryan Peniston 6-2, 6-2. The encounter lasted only 51 minutes. This entry was posted in ITF World Tennis Tour, ITF World Tennis Tour News and tagged Alexander Ritschard, Calabasas, ITF World Tennis Tour.